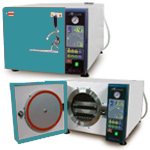 Roch Mechatronics Inc. Bench-Top steam sterilizer are an ideal solution for industrial, Pharma, Biotech, Mediacal research, Hospital , Diagonostic applications. Bio-Gene's autoclave pressure displays the present state in analog, and the temperature & Time display setting valve and present state in digital. Sterilizing process (Lock, Fill, Heat, Ster, Vent, Dry, End.) displays cycle display lamp. Only push botton, Could check the heater and the air Pump and remove of obstacle in the solenoid valve. Also avaliable analog control.